In an earlier post we discussed the advantages of an Oakland Central Station for the entire Bay Area. Today we look into the central station, new transit lines, and the future connection to the new transbay tube. A new transit tunnel and new train stations will offer the East Bay convenient hubs on the site of I980. Both stations will be vibrant meeting points on a corridor that will be home to thousands of people and jobs through the wise public use of the freeway land and careful redevelopment of the under-used Howard Terminal. It’s not just new residents that will benefit from smart investment in our infrastructure. People from every part of the city will get better access to new and existing jobs. Residents from elsewhere will be smoothly connected to the businesses, shopping, and cultural sites in Downtown Oakland. A central station at 14th Street connecting Amtrak and BART will be only a seven-minute walk to Oakland City Hall and Old Oakland. The walk to the Fox Theatre and the Oakland Convention Center from the central station would be only twelve minutes. 14th Street and I-980 is a perfect place for a multi-modal train station! The Connect Oakland Vision converts the I-980 freeway into a surface-level boulevard over a transit tunnel. The remaining current freeway land would be public land. This land could be built up with new development like housing, retail, or institutional facilities to meet the needs of Oakland. The tunnel could accommodate multiple BART lines, Amtrak’s Capitol Corridor, Caltrain, California High Speed Rail, or any other electrified rail service. Transit electrification will make the tunnel easier to build since gas and diesel fueled train and highway tunnels need expensive ventilation systems. Detail of transfers between BART and Caltrain on upper level. Concourse Level: Ticketing, circulation, travel services, food services, and retail. We simplify ticketing by grouping regional transit together and intercity transit together on different levels. Clipper on the top, ticket on the bottom! Different levels also allow for fast same-direction transfers from one side of a center platform to another. This would be similar to BART’s timed transfers at MacArthur and 19th Street, but would connect BART and Caltrain in the same direction. This important because more passengers will transfer between BART and Caltrain than between HSR and BART so the station should be designed to make these local transfers as easy as possible. BART operates on a different track width from all other services, so at least two separate tracks have to be provided for BART. High-speed rail trains are required to have longer 1,400 foot platforms. For comparison, a 10-car BART platform is 700 feet, and an 8-car Caltrain platform needs about 1,000 feet in length. So, the local transit level only needs platforms to be 1,000 feet long, while the Intercity Level would be 1,400 feet long. High-speed trains would most likely be making Oakland their final station for the foreseeable future. So they would stay at the station long enough to service the train after its journey from Los Angeles. If HSR was to share tracks with regional trains the stopped trains would reduce critical rail capacity. In conclusion, the central station should have two train levels to allow for cross platform transfers between BART and regional rail on the transit level and to accomidate different service patterns and train lengths of the multiple services that Oakland needs and deserves. 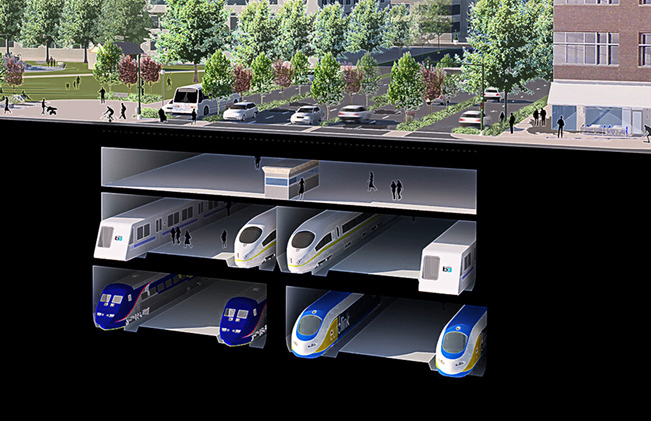 The raw concrete transit tunnel “train box” could be built first with the surface street replacement for I-980 while and the central station and connecting tunnels could be built as needed if connections for future services are accommodated. 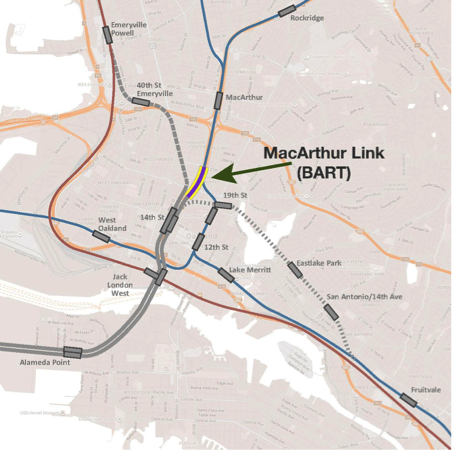 The MacArthur link initially links BART Red, Yellow, and Orange lines to the I-980 transit tunnel. The MacArthur station link would link existing BART Yellow and Red line tracks to the new 980 corridor. The 0.30-mile long tracks would connect the Transit Tunnel to the current BART tracks running on the elevated segment of I-980. Going north, the link would start as a tunnel at the central station, but would run over San Pablo Avenue and Grand Avenue to reach MacArthur Station. With an above ground connection to the existing BART system, this new link would be easier and cheaper to construct than an underground junction. The 980 Tunnel extends existing BART service from MacArthur through Alameda to a new transbay tube. In addition the vision could extend Amtrak service to San Francisco, and extend CalTrain from San Francisco to Oakland. A Jack London Station will terminate the south end of the initial I-980 tunnel. This station will provide much improved transit access to the western section of Jack London Square. The station will be located adjacent to Howard Terminal, a site currently being considered for a new Oakland Athletics ballpark. 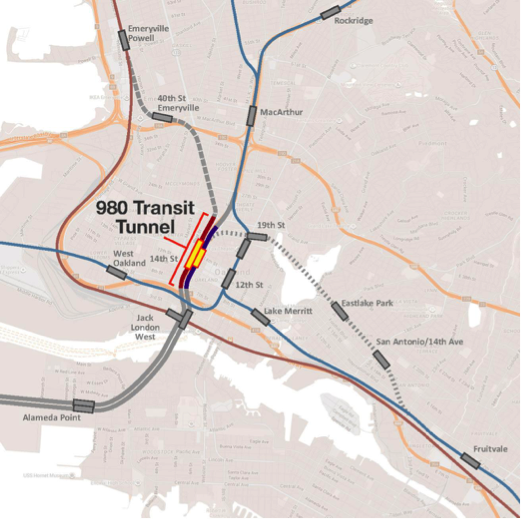 Initially, the 980 transit Tunnel would provide direct BART connections for some combination of Red and Yellow Lines to Amtrak, the ballpark at Howard Terminal, and possibly to a terminus station at Alameda Point. The Amtrak Station would move to a new street level station along Embarcadero at Castro Street. Amtrak passengers connecting to other BART stations would transfer from the street level Amtrak station to the underground BART Jack London/Howard Terminal Station, likely under Brush Street. Our next post will describe how this ambitious vision can be accomplished over time through careful phasing.